New deck! Just completed in April 2018! New Heating/Cooling system completed 2018---no need to worry about those unusual warm summer days now! 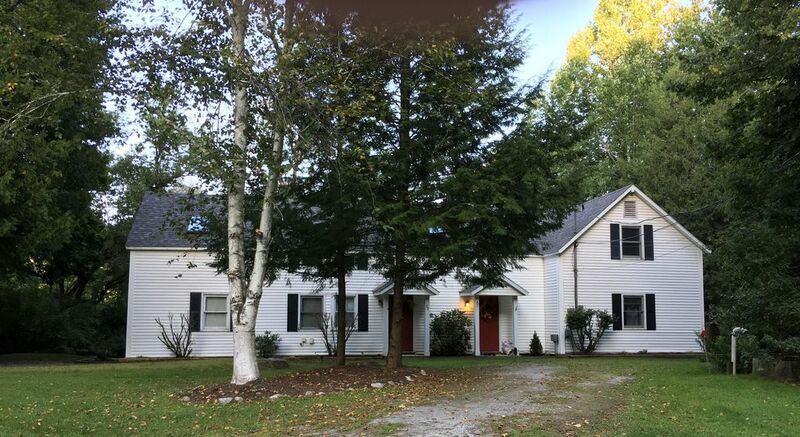 You are viewing the North side of a renovated farmhouse that houses two units (see our other listing for families or friends wishing to travel together, but not be "together together!" #916001. This would make 6 bedrooms, 4.5 baths and sleeping for up to 15! We are happy to negotiate a discounted rate should you book both units simultaneously. ) This property setting is on the Battenkill River, offering a peaceful view (& sound) of the running water. The backdrop hosts the Green Mountains. As private as it is, within a couple of minutes you can be in the heart of Manchester to take advantage of the shopping & dining! This particular unit has 3 bedrooms and 2.5 baths and is approximately 1400 square feet. We fell in in love with Manchester about five years ago. We weren't sure if the remote stereotype of Vermont would be too remote, but we quickly learned that this area has a wonderful balance of peace and nature, yet still boasts plenty of things to do, without taking much time to get to them! Whether a fly fisher, a reader, a shopping enthusiast, a foodie, leaf peeper, or snow lover, this area has you covered. WONDERFUL FOR THE VERMONT SUMMER FESTIVAL HORSE SHOW! Main floor houses a half bath, family room, dining room, and spacious kitchen. ***All bedrooms have individual window a/c units for those occassional warm Vermont summer nights. A larger window unit is also in the downstairs area. We are flexible with booking--and check-in dates and check-out dates. We don't want people to feel obligated to a 7 night stay from Saturday to Saturday. Check-in time is after 3:00 on day of arrival. Earlier check-in will be considered based on readiness of unit. Check-out is 10:30am. Absolutely NO SMOKING inside of the condo. built in window unit master bedroom window units in 2nd and 3rd bedrooms as well as dining area. please turn off when not at condo. This was the perfectly located perfectly appointed place to stay in Manchester. Everything we needed was present including cozy blankets and kindling and wood to build a fire. The Battenkill River flowing behind the house created the most peaceful setting. This stay made us want to come back in another season and explore and hike. We even hiked the snowy Lye Brook Falls trail nearby and the location is very close to Manchester Center's shops and restaurants. Amazing Home with and amazing location! Loved it! The house is newly renovated: well thought out, with great furniture and amenities. Location is close to Manchester Center, but in a quiet, tranquil spot on the river. The condo is beautifully decorated and has a very pleasing aesthetic. The view of the river is stunning. The location cannot be beat, minutes away from the town center and from area attractions. There were a few technical difficulties, and the owners were very responsive in dealing with them. I would recommend this condo. We stayed here for the Columbus Day weekend.The condo was cozy with plenty of room for our family of 4.Sitting in the backyard in the morning next to the river was so relaxing.All new appliances,comfortable beds and central location make this a great rental.We would definitely stay here again.